Traditionally SEOs don’t pay attention to 404 pages- they’re mistakes, after all. I used to think that, too. Then I read Google’s Search Quality Guidelines. In case you don’t know, a 404 page is the page your web-server gives a user when they ask for a page that doesn’t exist. Sometimes these are pages that have been removed from a website. Other times these are created by accident, through a coding error or a typo. Why would you optimize your 404 page? Lately I’ve been reading Google’s Search Quality guidelines. While reading it, there was one thing that shocked me: Page Quality raters are encouraged to assign ratings to 404 pages. Don’t believe me? It’s right there on page 30 and then again on pages 128 & 129. There’s another way that the Search Quality guidelines mentions 404 pages. A page’s quality is a function of the overall website’s quality. One factor behind a website’s quality is whether it’s being maintained. Part of this is making sure “links work” (page 15). How do you know if a link works? The 404 page will help. Perhaps this is one of the reasons Google asks its Search Quality evaluators to assign page quality to these pages. If that’s the case, and you want a good quality rating, perhaps you should optimize your 404 pages. It’s easy for SEOs to become laser focused on “ranking factors” or “page quality ratings.” This can distract us from the frustrating user experience people have when they encounter a terrible 404 page. A few months ago I bought a new piece of hardware. Later, something went wrong with it. I turned to Google for a solution. I clicked the search result and landed on the company’s 404 page. Not only did this exacerbate my frustration with the product but it made me disappointed with their company. On top of that I couldn’t help but think about their missed opportunity. If they had a useful 404 page, they might have found it and fixed it- allowing me (and others) to find a solution to our problems. Don’t let that happen to your website visitors. How can you optimize a 404 page? • Should convey the purpose of the page satisfactorily. What is the purpose of this page? To tell you the page doesn’t exist. • Supplementary content shouldn’t distract from the main purpose of this page- to tell you you’re on the wrong page. • Search functionality to find what you meant to look for. That’s the bottom line- does your 404 page help users to get to their desired destination? If not, put some “time and effort” into your 404 page. The Google Quality evaluators (and your users)will appreciate it. Does your 404 page send a 404 header code? Another way to optimize your page is to make sure it throws a 404 header code. When a web page is requested from a server, it sends a code with the page. If he requested page exists, it sends a 200 header code. If the page has been moved it will send a 301 or 302 header code (and hopefully the right one- but that’s another post). If someone attempts to access a page they’re not supposed to reach, the server will tell them by sending a 500 code. If a page simply doesn’t exist- it should send a 404 header code. Why is this important? You want a search engine spider to receive the proper header code. That way the spider knows what to do with the page. A 200 code reassures Google it’s where it’s supposed to be. A 300-level code tells it to go somewhere else. A 500 code tells it to get outta here. A 404 code tells it that it’s reached a dead-end. How do you know if your page is sending the right header code? First of all, you need to find an example of an error page. Try to create one yourself: visit yourwebsite.com/no-page.html (assuming that page doesn’t really exist on your website) and see what happens. Do you get a human-friendly page or some technical gobbledygook? Take that URL and put it into a header checking tool- it will tell you the header code that gets returned with the page. I like the SEO Book tool. Oops- the Bible Gateway might have a quality page, but it’s sending the wrong server code. If the code says anything besides 404, you need to fix it. Sometimes websites have a variety of error pages. Some are generated by the CMS and others by the server itself. Try a couple different URLs and see if you can get a different error message. Each should return a 404 error- and both should be very user-friendly. If we try the no-page.html trick on the Bible Gateway you’ll see that this one serves a different 404 page. In this case, it serves a 404 header code. It appears that the Bible search feature is sending one error page but the server a different one. In this case the CMS (search feature) is incorrect but the server’s error page has been setup correctly. The third way I’d optimize a 404 page is to make sure it includes your Google Analytics. In addition, make sure you have a unique title tag on that page as well. Something as simple as “Page Not Found” will work. 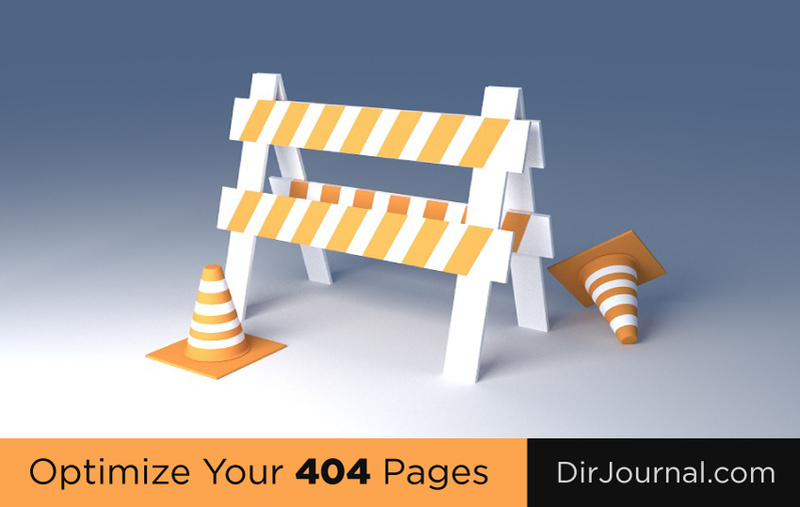 This will help you keep up with your 404 pages so you can better maintain your website. With both of the pieces in place, you can setup a simple report (at least in Google Analytics) to tell you if anyone is landing on a page that doesn’t exist. Go to Behavior > Site Content > All Pages and then change the Primary Dimension to “Page Title” and search for the title tag for your 404 page. If you click on the Title for your 404 page, you can see a list of all the URLs with this Page Title. That means you’ve got a list of all the pages on your website that have been requested, but don’t exist. Bonus points if you send yourself a weekly list of these pages by email (or use an SEO Dashboard to keep track of them). This won’t be all of your 404 pages. Google Analytics will only know which 404 pages people actually visited. For a more comprehensive list, turn to Google Search Console (Webmaster Tools). Also, take a look at a Majestic page report for your website, which will tell you all the 404s that have backlinks, even if they don’t get any traffic. “optimize” your way out of as many 404 pages as you can. What should you do when you discover a 404 page? There are a couple options. If you notice that you’re getting a lot of traffic to a page that no longer exists, you should consider building a page. I’ve seen it time and time again: a company rebrands a service so they take down old pages and build completely new ones, with their new branding message. When someone searches for an old service they try to get to an old page but are only frustrated when they get a 404 page. It makes a company look like they don’t have their act together. Who wants to work with someone like that? In addition to frustrating customers, this can lead to a decline in search engine traffic to the website. Those pages were driving traffic but, now that they’re gone, they can’t anymore. In other words, if you think your business will benefit from traffic to 404 pages, build them out. When it comes to 404 pages, you can’t just think about the visitor. You need to think about links. Links are votes of credibility to your website. They are a major part of how Google decides which of your website’s pages to show in the SERPs. They are so important that Google has been cracking-down on websites who abuse their power. That’s made it more difficult for some webmasters to get links to their website than ever before. If another website links to a 404 page on your site (especially one with a 404 header code) your website does not benefit from that link. That means you need to fix it. In some cases, you’ll want to re-create the pages. If that doesn’t make sense (for instance, the website’s link has an error) you’ll want to setup a 301 redirect to the proper page. There are several ways to setup a 301 redirect. Some CMSeshave plugins that can do this for you. If not, your developers can add them to the .htaccess file or config file on your server. All they will need is a list of old pages (404 pages) and the new page to which they should send through the redirect. Please make sure they use a 301 redirect. A 301 header code tells Google, “It’s not here, it’s there- permanently,” and Google will then give credit from the link to the new page. Sometimes developers setup redirects using a 302 header code. In fact, most platforms send a 302 header code by default. The problem here is that you’re telling Google, “It’s not here, but it will be back sometime.” In that case Google keeps the old page in the index and doesn’t pass the link authority to the new page. Please don’t just 301 every page that’s not found. Every once in a while I find a website that was built by someone who knew just enough SEO to hurt themselves. They read that whenever you find a 404 page you should 301 redirect it. This is the right solution (we’ll get to that, later) but you don’t want to simply 301 redirect every error page to your homepage. First of all Google hates that. Second of all, you’ll never be able to tell if something is wrong with your website. Remember my example, above, when I was looking for a solution and encountered a 404 error? If the website automatically 301ed that page to the homepage, they would never be able to tell that people were still looking for solutions to that problem. Another reason you don’t just want to 301 every page is because you might lose traffic. Again, 301 redirects are the right solution to a 404 error but if the page that once existed used to send you a lot of traffic, that traffic will evaporate once it hits your 301. I’ve seen websites take down entire sections and install the proper 301s, only to see a dramatic drop to their search engine traffic. David Zimmerman is an internet marketing consultant, specializing in search. His company is Reliable Acorn, LLC. When he is not on Google you might find him in his garden or hiking in the mountains of North Carolina. How To Reduce Your Site’s Bounce Rate and Keep Them on Your Site! Very informative post on 404 pages. There are mainly 2 things to do with 404 pages or error codes. First we can redirect the visitor to another relevant page permanently, second, if we do not have knowledge about a 404 page (mostly because of mistyped or wrong backlinks) then a custom 404 page with custom and attractive design help us to retain the visitors on the site. The way you elaborated this will surely help other beginner optimizer and designers.